Having a beautiful Thanksgiving table can help set the dinner mood. Sometimes the table gets more compliments than the turkey! 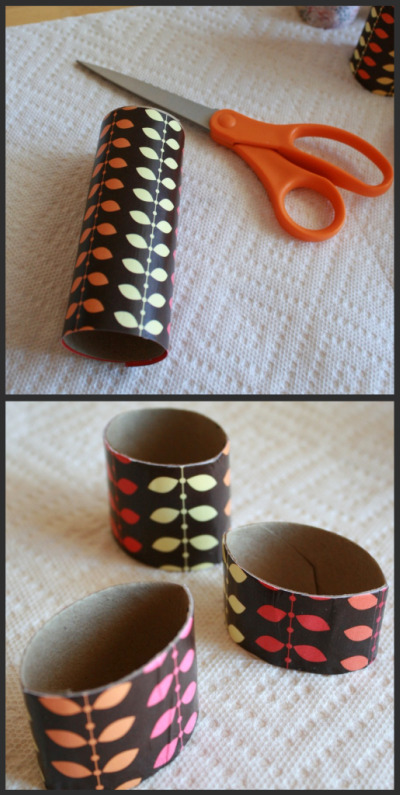 Here’s a fun way to spice up your table with these decoupage napkin rings made from recycled paper tubes. 1. 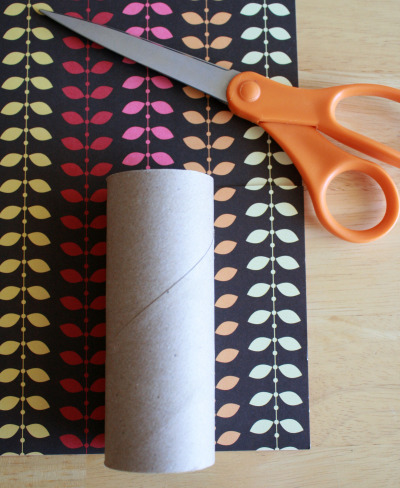 First, measure and cut your piece of paper to fit around your paper tube. You’ll want the lip to over lap just a little, about 1/4 of an inch. 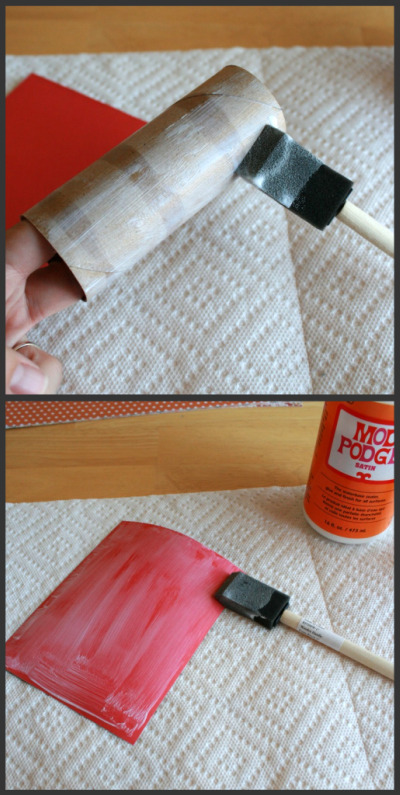 And it’s okay if it’s a little longer than the tube, you can trim the extra paper off after it’s done drying. 2. 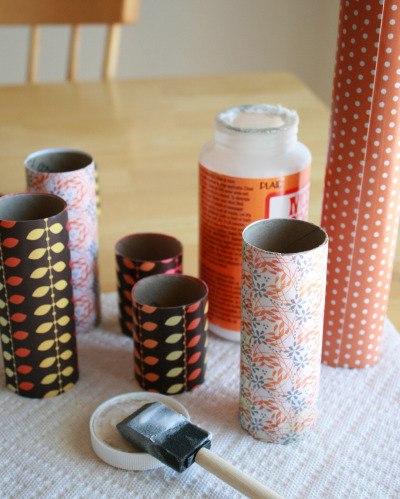 Apply decoupage to your paper tube, make sure you get every inch. 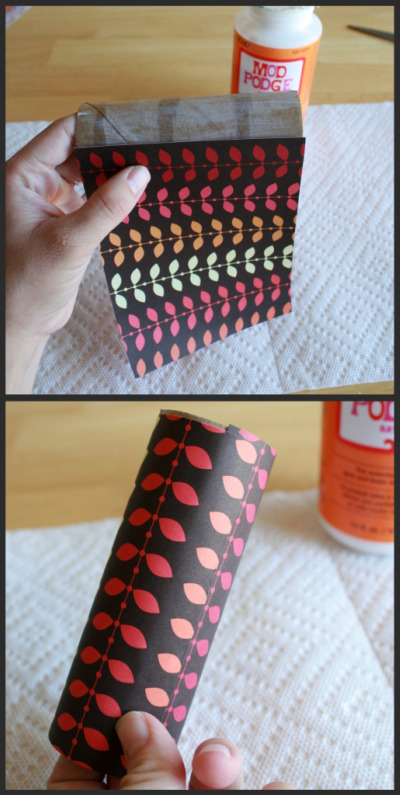 Then apply it to the inside of the paper, the side that wraps around the tube. I like to apply glue to both of these, just to make sure it sticks and stays on. 3. 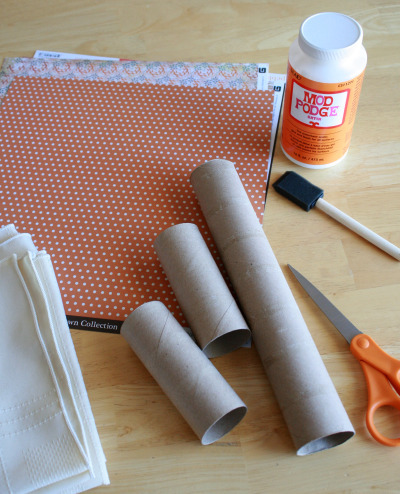 Attach the gluey craft paper to the gluey paper tube and roll it on. Smooth out any bubbles or bumps. Make sure it is sealed on the edges. Then let this dry and set for at least 10-15 minutes. 4. 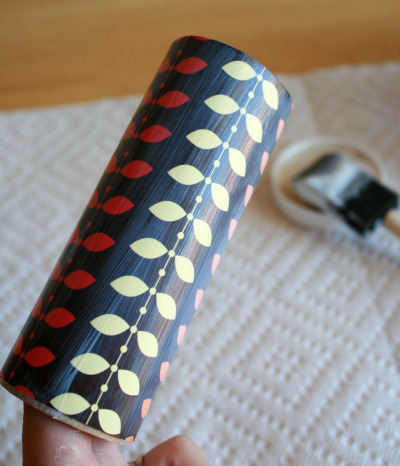 You will now apply another coat of decoupage to the outside of the paper craft tube, to help seal it, and it gives it a nice shine. Then let this dry completely, up to 30 minutes. 5. Once the paper craft tube is dry, you’ll need to cut it down into little 2 inch rings. Since the tube is kind of hard at this point, in order to cut through it, you’ll need to smash the tube in half, bending it enough to get your scissors around. Then cut 2 inch sections out of the tube. You can also trim any little extra bits of paper that may be hanging over the edge of the tube. 6. Using your fingers, try to mold the tube back into a circle (although, this doesn’t matter too much, as it will be around the napkin anyway). 7. Now it’s ready to add to a fan folded dinner napkin. Just slip it over and spread out the napkin. I also added some pressed leaves that I wrote the dinner guests names on, and a few berries (not edible). You could also add acorns or feathers, something else to give it some flare. Have fun dressing up your table, as well as your turkey! I love that these are simple and pretty, and fun to make with the kids! I definitely want to try this for Thanksgiving. Super cute! I think I might do this! I have to decorate for a church party next week. 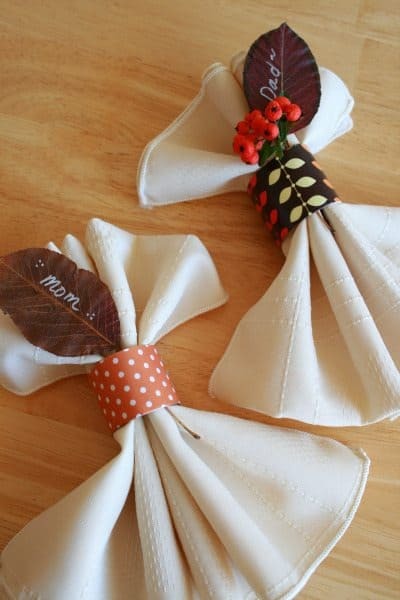 I’ll totally do this for the napkins. Thanks for the idea. Wow! I can’t believe how easy! These are absolutely wonderful! I love. This is a wonderful, cute and easy idea! I’ll be using this one for other holidays too. Thanks for the great crafty idea! So cute! I used your idea for my family’s Thanksgiving table and it turned out great! Thanks for the great idea!